Total Weight Gain: 3 lbs. Okay, here's my weight gain shpeel... Some may find it narcissistic, but I love seeing when the pounds come on in relation to how my bump is growing. I'm also excited to compare this to my first pregnancy. I'm a numbers person, and I like keep tracking of this. However, I started this pregnancy 10 lbs under weight, so I expect to gain those back & the baby weight. Not sure if I'll be staying under 30 lbs this time around, but regardless I plan on having a fit & healthy pregnancy. Symptoms: Seems like I nearly have them all this time. Exhaustion, nausea, headaches, insomnia... With Liam I just felt a bit "hungover" throughout the 1st trimester, and it didn't even start until I was about 7 weeks along. This pregnancy has been much more difficult. The nausea kicked in at only 5 weeks and is almost all day, but worst in the evenings. And the nausea almost feels debilitating at times. However, I just LOVE being pregnant so I'm still thoroughly enjoying the whole process. Gender Predictions: I think it's a boy (I've had one dream about it), but my mom & Conor are both absolutely convinced it's a girl. I can't wait to find out! I will truly be happy either way; although, I really want a girl at some point... So now would be a nice time. Then when deciding whether or not to have any more children in the future, our decision will not be affected by wanting a specific gender at all. Sleep? Not so great. I fall asleep just fine, but am easily woken up and have a terrible time falling back asleep. Pregnancy insomnia is real, at times I will find myself messing around on my phone for 2 hours in the middle of the night. What is awesome, however, is my Snoogle ! It is perfectly broken in from my 1st pregnancy, and I am in love with it! It needs a new cover, so I'm on the hunt for some cute etsy options. Miss Anything? I definitely missed a good cocktail or glass of wine (or three...) throughout my 1st pregnancy, but this time it's no big deal. What I really miss is my energy! Oh please oh please come back! Food Cravings/Aversions: No big aversions yet, but that's mostly because no food sounds good. I have been craving fruit quite a bit, especially honey crisp apples dipped in caramel sauce! Staying Active? Yes! I'm having a much more active 1st trimester then I did with Liam! Right now I'm trying to get in 3-4 workouts a week, since that is about all I can handle. Hoping to up this once I am feeling better. I'm currently hiking, running, & swimming, but love running best when pregnant! Nursery Progress: All I know at this point, is that Liam's current playroom will become baby #2's nursery. However, we won't start doing any of those changes until after Christmas. I'm simply in the brainstorming stage right now. Liam's Thoughts: He seems to be understanding the whole baby situation. He knows there is a baby in mommy's tummy, in which he always refers to as a "he." And he constantly talks about how he will hold the baby once it is all done growing. He will say hi to the baby or kiss my tummy and it really is just the sweetest thing! He also knows the baby will have "nini", and he gets all sorts of smiley about that! Looking Forward to: More energy and no more nausea! So excited for you and your sweet little family! Can't wait to follow along with your bump dates this time around!! I missed wine so much my first pregnancy! I hope you get your energy back soon!! So excited for you and your family and excited for the bump dates! I didn't find you until after Liam was born so it will be fun to read. Hope you start feeling better soon! awww, bump dates are so fun to read. And like ELizabeth said, I didn't know you when you were pregnant with Liam so it will be fun to see this journey of yours. I don't think it's narcissistic at all to list weight. It's interesting for me, as a non pregnant person to read and hypothesize about myself and if you like numbers, you list those numbers. I hope your energy comes back and sooooon! Looking great - first trimester is so hard, hope you feel better soon!! So exciting!! I hate that you aren't feeling great, but at least you are still loving pregnancy and getting in some exercise!! I can't wait to watch you grow more!! So cute!!! You look adorable! Oh, I hope your energy comes back! 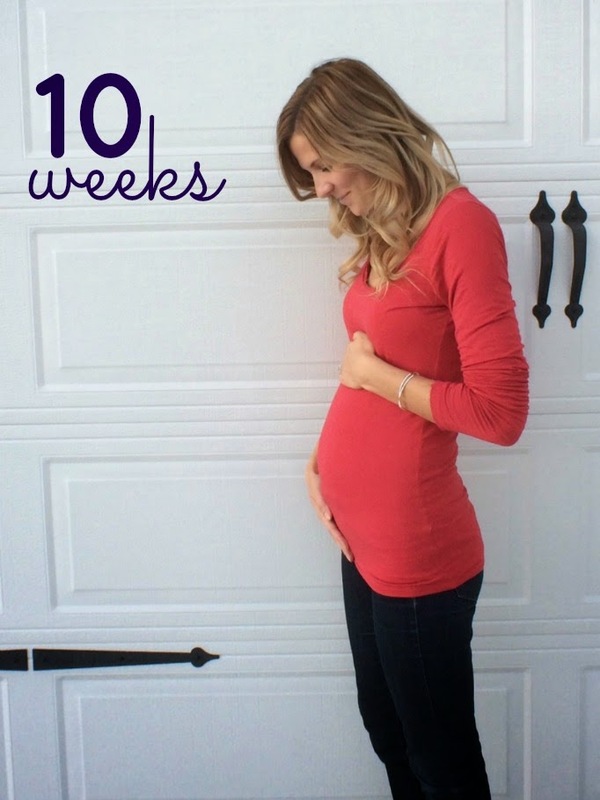 Unfortunately, for me, I didn't feel like my energetic self this entire pregnancy. Keeping up with toddlers is difficult! ;) Also, love the "cries" section! I would definitely have something for that every week!